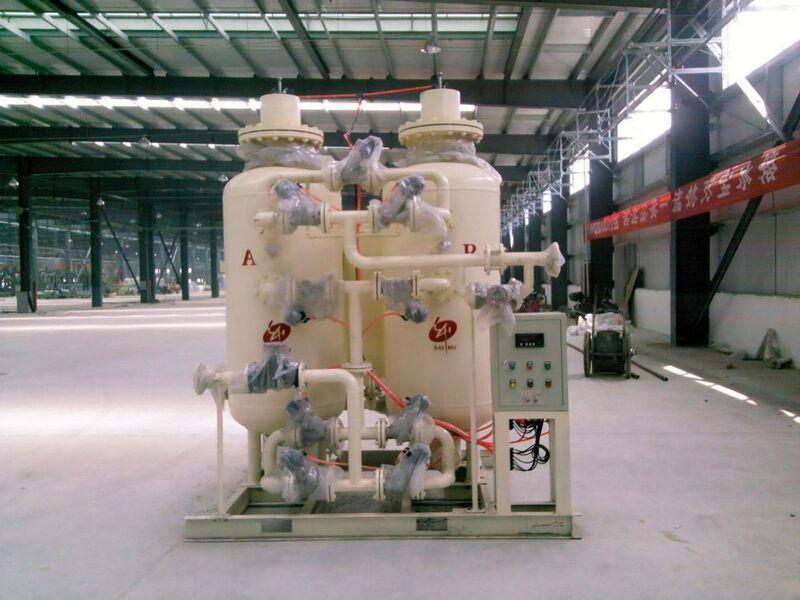 Process Flow Brief Description : Air after pressurized to the adsorption pressure by air compressor, is fed into adsorbers prior to passing the filtration of refrigerating Dryer. The adsorbent is carbon molecular sieves. It is just making use of the property that adsorption amount of oxygen and nitrogen differs on the surface of the carbon adsorbent to adsorb O2 and desorb N2. The opening and closing of the program valves are controlled by the programmable logic controller (PLC) to complete each cycle of adsorption and desorption and then N2 is produced with the required purity. The two adsortbers are in adsorbing and desorbing alternatively to ensure N2 to be generated constantly and steadily. 1. It is an advanced technology with less investment. 2. The quality is reliable and both the N2 purity and quantity are stable. 3. The unit is supplied in a skid-mounted manner, which can be transported and installed easily. 4. It is full automatic control and no need for operators, easy to start-up and shutdown, simplified and convenient maintenance. Looking for ideal PSA N2 Device Manufacturer & supplier ? We have a wide selection at great prices to help you get creative. All the PSA Nitrogen Generator are quality guaranteed. We are China Origin Factory of PSA Nitrogen Device. If you have any question, please feel free to contact us.